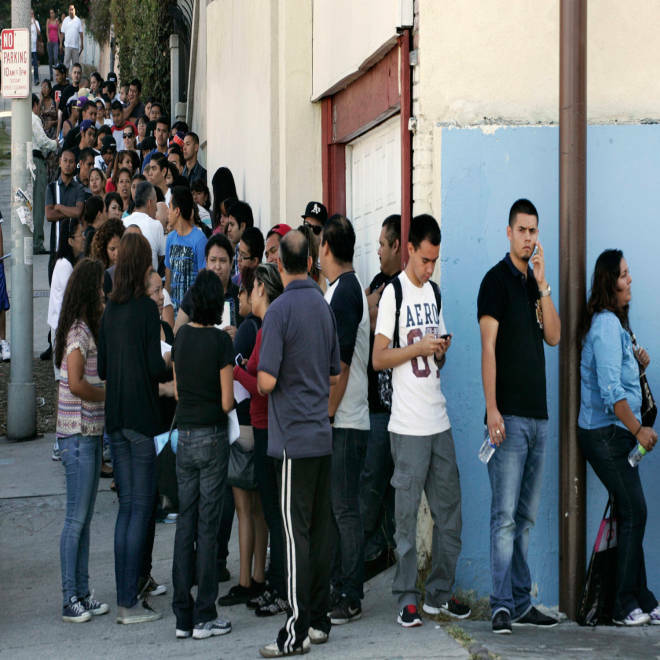 People line up for assistance with paperwork for the Deferred Action for Childhood Arrivals program at the Coalition for Humane Immigrant Rights of Los Angeles in Los Angeles, California, August 15, 2012. WASHINGTON — More than half of U.S. citizens believe that most or all of the country's 11 million illegal immigrants should be deported, according to a Reuters/Ipsos poll released on Wednesday that highlights the difficulties facing lawmakers trying to reform the U.S. immigration system. Thirty percent of those polled think that most illegal immigrants, with some exceptions, should be deported, while 23 percent believe all illegal immigrants should be deported. These results are in line with other polls in recent years, suggesting that people's views on immigration have not changed dramatically since the immigration debate reignited in Congress last month, according to Ipsos pollster Julia Clark. "It's not Americans' views that are shifting. It is that the political climate is ripe for this discussion," after the November election when Hispanics voted overwhelmingly in favor of Democratic President Barack Obama, she said. "Democrats feel that the time is right to capitalize on their wins and Republicans feel that they had a bad blow and are eager to reach out to Hispanics," she added. Polls show that most Americans back immigration reform, although they often have different ideas of what that means, with some people favoring looser immigration laws while others want to see greater border security. A group of eight U.S. senators are working on a bipartisan deal to enact immigration reform, the first major attempt since a similar overhaul died in Congress six years ago. The senators' proposal calls for a full path to citizenship for illegal immigrants once they pay back taxes and a fine and wait in line behind others applying to become Americans. A plan by Obama has similar provisions, but the senators want any move to relax immigration laws dependant on boosting security on the southern border. Attitudes toward immigration are polarized by party, according to another the Reuters/Ipsos poll. Seventy-five percent of Republicans think all or most immigrants should be deported, compared to 40 percent of Democrats who think the same. Republican Senator John McCain, one of the eight senators in the group, had his own encounter with citizens angered by illegal immigration on Tuesday when residents of his state of Arizona complained bitterly at a town hall meeting about the lack of security on the border with Mexico. One man asked why troops had not been deployed to the border. "Why didn't the army go down there and stop them? Because the only thing that stops them I'm afraid to say, and it's too damn bad, is a gun," the man said. Another resident, Keith Smith, got into a testy exchange with McCain, the 2008 Republican presidential candidate whose views on immigration have fluctuated over the years. "Cut off their welfare and all their stuff and they'll go back," Smith said, referring to undocumented workers. McCain had been trying to explain his position: "You're not telling these people the truth. They mow our lawns, they care for our babies, they clean ... that's what those people do," he said. The Arizona lawmaker, whose position on immigration hardened during the 2010 midterm elections before softening again, is a key part of the Republican side of the senators' bipartisan immigration effort. Wednesday's Reuters/Ipsos poll was conducted Friday through Tuesday and surveyed 1,443 Americans over the age of 18. The precision of the Reuters/Ipsos online poll is measured using a credibility interval. In this survey, the poll has a credibility interval of plus or minus 2.9 percentage points.